Please leave any feedback for Your Input - Icon Shape here. I placed Line 1 in both Click and Toggle - I would imagine it would remain compressed when active/toggled so that players could identify when it is on cooldown or activating by changing colours possibly. (maybe allow the player to select a different colour to make it identifiable. I place Line 2 in Macro - the smaller nimbus, as the shape has multiple sides it helps represent the many actions of the macro. I placed Line 3 on Meta, as meta represents the shape is quite unique and powerful with all of its changes in angles, it represents the fact Meta changes/affect your abilities. I placed Line 4 on Augment, as it seems more industrial with its hard lines, with the larger nimbus it holds it well and I think this would represent a locked in augment well. I placed Line 5 on Reserve, as its darker tone and higher level of detail with the small red dots on its border, help represent the last reserve, maybe the dots could become lit and darker the rest of the marker when it is active ? I placed Line 6 on Refinement, as the circular nature is quite simple but also quite refined as its only a single line, I could see this fitting the role of refinement. 1. I would like to add that the triangular button shape could be rotated in different directions to achieve different looks for different things. I chose "triangle" for both Augments and Refinements, but I would personally try to save space and fit everything together better by using alternating "pointing up" and "pointing down" triangles where they might be next to each other. 2. You could also rotate the hexagon such that it's flat sides are left and right and the corners are up and down, thus causing them to fit better in the tray, maybe. I think in cases where the shape has two flat parallel sides, you ought to use that as left and right sides of the button, not top and bottom. 3. I think the square or rectangle shape works best for macros, because it gives you the most usable real estate for iconography and text. I would therefore use that for both the regular click powers and the macros, if macros are all going to use the same shape all the time. 4. I like the circle for toggles, as they will probably have a graphic that tells you whether they're on or off and that might be some kind of circular pattern of lights or something, which the circle lends itself to. 5. I didn't assign the octagon to anything because I felt I didn't need another shape. I have nothing against octagons per se. If you like it better than any of the shapes I chose, go ahead and use it, I just thought both click and macro should both be square, because it gives the most area to work with for iconography and for text. 6. I think both Augments and Refinements ought to be the same polygon, the triangle, but maybe pointing in different directions sometimes. Maybe Augments point up and Refinements point down, so that a Refinement modifying a given Augment would end up directly under the Augment on the screen, flat-side-to-flat-side adjacent to it. Then if you have more Refinements attached to that Augment, they nest together by alternating the directions of the triangles. 7. For macros specifically, if they can activate a power, but are limited to at most ONE power, then I would make the macro shape and icon match the power being spoofed, but add a new name for the macro, so it would look like the power it's using but with a different name, which would appear in text either on the button (like CoX) or someplace else. It would also be an idea to reverse the colors for the macro icon to make it look LIKE the spoofed power, but not like an exact copy. 8. Augments COULD maybe use a pentagon shape, with one corner pointing up, then have a triangle with the flat side up positioned under the Augment such that they share a flat side. Then, Augments that have more than one Refinement slot could use a pentagon with the corner pointing DOWN, such that 2 or 3 triangles could fit under it, still abutting the flat sides of the pentagon maybe. I like Radiac's suggestion of pointing an odd-sided polygon to show state (better than color for the color-blind). I chose the triangle for Toggle along those lines. Curiously, Reserve could not be set to "6", says "limited to 1 to 5" when I attempt to submit. 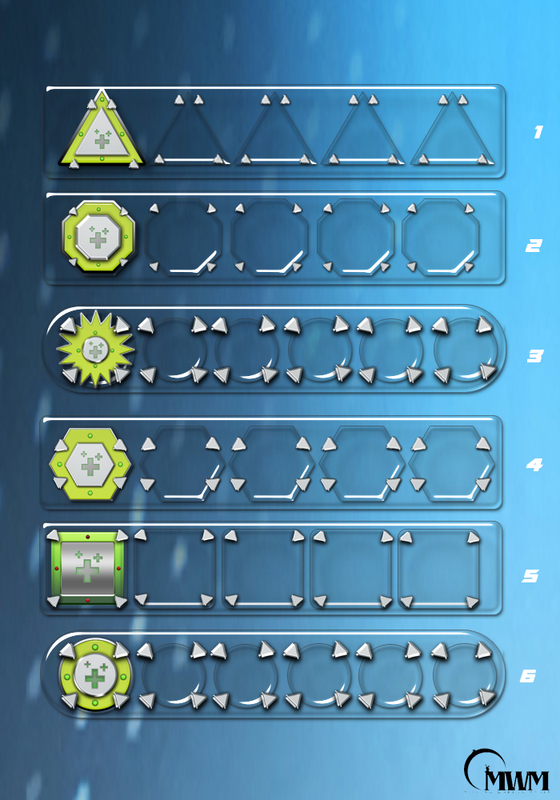 I chose the round buttons for a few of the clickable things, I just like them. But Radiac's suggestion of square for Macro (for its real estate) made sense to me too. I agree, the original post about augments and refinements used up and down triangles and it kind of stuck in my head. The reason I would like the hexagon rotated 90° is to help to not confuse it with the octagon, I think having a pointy bit at the top and bottom would stand out more. That is if we do use both hexagons and octagons in our trays. So, here's what I did and why. I voted for the same shape for every icon that related to power/ability activation, because I really HATE when games use a mixture of icon shapes (Skyforge). It just makes your power bar look awful, and would prefer if you could use other ways to differentiate power types. I of course chose #6 (Circle) for nostalgia's sake but would also be fine with all Square, Hexagon or Octagon. For Augments and Refinements, I put both as #1 (Triangle), and would agree with Radiac (et al.) comments about having Augments point upwards and refinements point downwards. I'd position them with their flat sides flush with each other (just like in the article discussing Augments/Refinements). I don't care for the little starburst/explosion shaped icon at all, because it just reads funky/kludgy/amateurish to me. Augment and Refinement, being non-clickable add-ons of a sort, could be represented by, for example, the left half of a star for the first, and the right half for the second, with the star being the power icon in this case. It would have to be different enough to be distinguishable, so the square may have to be divided on the diagonal if it were used. My concern was that the hexagon and the octagon look fairly similar when you give them a quick glance, and I don't want to have to look at a tray that close if I happen to be in combat. Having the icons be color-selectable could be a help in this, so that if I had a macro that would toggle on all my defenses at one time I could make it a distinct color and shape and could choose a color that I could differentiate if I were color blind and couldn't see certain colors as well. I chose Triangle twice as well: You can fit twice as many in a tray (Augments pointing up and Refinements pointing down). Im sorry if my comment is out of place, maybe im just confused, but why the different shapes, and dots and bevels, and gradients? I think its too much when you are looking at a tray of 10 other buttons or more. I really liked how the COX buttons were just circles with symbols on them. And if they were activated, there was a spinning circle. Augments and refinements, IMHO don't need icons in the main UI at all. If they cannot be changed in combat, they can be shown in a pull-down or pop-up menu for when they can be changed. The "1" I submitted for Augments and refinements is only a placeholder; what they look like in that hypothetical window is perhaps a matter for another discussion. Perhaps it would depend on which kind of Augment or Refinement it is? The #1 for the Meta powers, is from the Greek letter Delta, which scientists use to indicate change or a rate of change. The Macro gets #5, for maximum notes or images put in by the user to indicate what the macro does. Images should also be an option. The circle in #6 represents things like the Big Red pushbutton on many real-world controls, so I chose it for the click. The octagon of #2 is used for stop signs in the U.S., so I chose it for the toggle powers that you need to click again to stop them. Icon #1: Augments and Refinenents. The MWM devs decided to showcase the icons for them like this, and that's how I've been envisioning them ever since. Icon #2: Toggle. They look a lot like circles, and as they shared that shape with Click, I opted to give toggles the octagon since it was the closest shape. Icon #3: Meta. Because I've got nothing to go by. Icon #4: Macro. It's another action button that seems to be in a similar vein to activating powers or moves, so it gets something that's less like a circle but not too far from an octagon. Icon #5: Reserve. It's the same shape as the inspirations from CoX. Icon #6: Click. These were used for powers in CoX, which tend to be clickies. Personally I don't think this is a place where you'll ruin the game if you get it wrong or make the game a total hit if you get it right. CoX had circles for everything and that worked, GW2 uses squares for everything and that is fine too. It might not be ideal for everyone, but wont bring down the servers or anything if you do it less than perfectly either. Click: Octagon. I like Radiac's idea of using the square because it gives more space for icon and words, but I think Macro's and Click should use different icons so I put the octagon here, since it has the second most space, and the square for the Macro. Toggle: Circle. It is just natural for a toggle button. if shaded correctly it is easy to tell if it is turned on or not. Reserve: Hexagon. I agree with eislor on this point. The hexagon should be rotate point up so it is easy to notice the difference between it and a octagon. Augment: 16-Star. I would use the 16 pointed star here. Refinement: 8-Star. I would use an 8 pointed star here because refinements are "part of" or more precisely an adjustment to an Augment just like an 8 pointed star is part of a 16. Meta: Triangle. I like Radiac's idea of alternating the direction of the triangle if they sit next to each other, which works well for meta's because they include power buffs. That way if they are displayed over characters or mobs then you could use the same type of symbol as the power which applied it. Go on, somebody tell me that isn't more intuitive. Icon 1: Augments and Refinements. Not only was that the way they looked in the original mock-ups, but I'd avoid triangles for anything one would click in the haste of battle, simply because the reduced surface area makes them easier to miss. Icon 2: Meta. Had to pick one of the 2 that were left after I assigned all the others, and this fits in a tray better than the hexagon. Icon 3: Reserves, cuz POW! Icon 4: Unused -- too much like octagon. Icon 5: Macro. As others mentioned, more room to type a name. Icon 6: Clicks and toggles. (Assuming some kind of graphic effect to show toggle status.) Mostly out of nostalgia. But also to ensure that CoT looks different from the majority of games out there. OK that is much more intuitive. Reserve: Square. If they're like CoH augments, then being easy to grid is going to be important. Macro: Octagon or Hexagon, this makes it immediately discernible from the powers. Preferably we'd also be able to assign a picture to these? Augment: Triangle seems to work, like from that one post forever ago. Refinements: Square, because if they're going to be hanging off the bottom of the augments we want them to be space-efficient. Meta: ...depends. If this is like rest/sprint/etc, a kind of innate thing that is like a power but a common ability, some kind of non-cricle shape is understandable. Hexagon, maybe. If these are powers from power sets (my mind leaps to the ammo change power from dual pistols), then they should be circles, but with a mode/time animation. Being able to look at your ammo mode power and seeing that it has a fire picture right now is faster than having to mouse over it for whatever purpose. Some notes: turning the hexagon up on point seems like a good idea to me, whatever it's used for. It'll sit side-by-side easier that way, and be more distinct from the octagon. I did not list the star, no, I didn't feel it fit anywhere nicely. I DO notice, however, that the star has some extra nimbus space, so maybe it could be used for some subset of powers? Complicated rare-use powers that take minutes to charge, or something. That said, I'm not sure the loss in normalization would be worth this stylistic change. The mention of a Reserves button got me wondering about how this will work. I understand I might be relying too heavily on the way our old game functioned, but if Reserves are meant to be a catch-all that's roughly analogous to Inspirations (covering health, defence, wakies, etc), how will we tell the game which use we intend when we click that Reserves button? If I'm understanding the basis of this discussion, the only way there would be only one Reserves button is if there is only one use of Reserves available to the character as built. Just as a given character might have several click-activated powers, or several toggles, the different uses of Reserves would each have their own button, each the same shape but with a different icon inside that shape. That would certainly be one reasonable way to implement it. Is that just conjecture or has MWM stated this will be the case? It seems entirely plausible that we'd use the 1 thru 0 number keys across the main keyboard for powers and the function keys F1-F4 for Reserves. I don't know if 4 function keys will be enough, but it's possible. That's sort of the analog of what CoX did. Not sure if I understand enough of the context of some of the divisions to make an informed suggestion. Before I read fully over the question/poll and had only skimmed the image example, my very first inclination was "make buffs use the up triangle and debuffs use the down triangle". But it doesn't seem that is the nature of the asked question, where I'm thinking that making, say, a Radiation Infection-type power be a down-triangle debuff, the question would place such a power in the Toggle type. And I'm kinda guessing these distinctions aren't subject to change, the different shapes are going to be for Click, Toggle, Macro forms of power usage, not for such styles as ST Damage, AoE Damage, Buff, Debuff, Control, etc. I feel like the border triangles are themselves somewhat wasted space but maybe with a row full of very different-looking icons they would serve as much-needed "spaces" to avoid a Wall of Text effect. Despite initially liking the triangle shape (for buff/debuff) I'd say its the least visually appealing as a space-waster. I like the idea of the square for macros with most powers being the hexagon (2), with perhaps the reserver power being the (3) circular explosion. Really dunno what to think about Augments, Refinements, and Metas. I tend to think about Meta powers as being similar, maybe, to Build-Up and Aim from the CoX Blaster sets. They were self-buff powers, but made the next attack or two hit harder or more often. If I'm wrong about that, I hope someone will let me know. And not all of these buttons shapes are necessarily going on the power tray, as the Augment and Refinements shapes would be used in the power/slot "build" screen not the normal play GUI. Thanks Doc. That works for me. Of course, now I'm wondering about the details of exactly how Reserves are assigned to the various uses (if at all -- or is it just a pool of points we can apply to the specific use of our choice at the time of button click? ), how access to the various uses is gained (at certain levels, or by classification, or do we always have access to all of them from the start?) etc etc. If I have to wait till the next Reserves-themed update, I understand. Those are two examples of Meta, but so are the Shapeshift powers. They change the way your powers behave, possibly even what they are temporarily. The only Shapeshift powers I can think of that CoX had were the Kheldian Human/Squid/Lobster powers. I take it from this mention that such types of things are on the table for possible power sets, but probably not by launch time? Hmm... what was the approach for knockback vs knockdown for the same power? is it a Meta power (toggle on/off) or was it some click delay on a power? even if i have to hold down Shift + click to do it. Can a Meta power have more than 2 states? If a power is designed with a switch between knock back and knock down, it will use a charge mechanic. That is, a brief holding down of the power's icon and then it fired off. We have some back up options to explore if this doesn't work out well during testing. But, it is what we are gojng with first. That was axed over a year ago. Shame that click and hold could be quite interesting for some abilities, for example if you had an ammunition system before having to have a character "reload" they can scale their damage across abilities depending on what the situation is. I'm a major fan of the Hexagon. The square also has a great general shape and gives the most space for visual cues/information. The most important thing for me is knowing what information is being given to the players via the icons (and via the visual effects) so that people can still tell what's going on... even when powers don't look alike. Having played Star Trek Online for a number of years now, I can tell you that any system which does Knock/Repel in only on direction ... "away" ... is going to be inadequate. You're going to need to be able to create Powers that "pull towards" rather than just "push away" from a specific point. Being able to "Yoink!" all Foes in a specified volume towards a specific point, either on the ground or in space (or in the air, in our case) is just too damn useful to throw away. And that's before we even get to the Scorpion of Mortal Combat styled "Get over here!" PULL using a tether. The key to all of this is the notion of involuntary movement of Foes ... either towards or away from ... to affect the tactics of positioning during combat. Also, the Scorpion styled "Get over here!" move is essentially a Gap Closer, that moves the $Target instead of the caster. The problem was that to do such a system would require a far more complex animation control system, which in turn would have forced us to be far more restrictive in the animation options for all powers. So it was make click and hold an option, and abandon power themes or maintain the customization of power looks, and keep the buttons as just a click. While it'd be nice to have a few charge powers, range of power customization options does completely trump having a few charge powers if it's an either/or situation. Still, I wonder if "charge powers" could be faked in a satisfying way? Like, say, where one click is the fast, low damage, knock down version and a double click is simply a second slower animation option with a set, longer animation time and more damage and knockback? Or where a click does the same as above but if you hold for say, anything more than .5 or 1 second it sets off the same as the double click example above--and again it's not a true charge, just a second animation with a longer pre-set animation time that will go off at the end of the animation time, even if you're still holding the "hold". If this were possible, then it is also much less "twitch" than a true charge power would be, in that the double click is ubiquitously used in almost all interfaces, so people are already familiar with it and doing it hundreds of times per day. Or in the case of a .5 second "Hold", if holding the key simply set off a second pre-determined animation with a set time rather than being actually "upon release" like a real charge power, combat timing isn't really a factor the way it is with a real charge power. I think this could be very fun way to get around the true Charge power problem that also avoids the twitchiness of a true charge power. And I say all this with the full faith and confidence that comes from the naivete and ignorance of not being a programmer or game designer :P.
Use the simple circle. Simple is best. No matter what shape we use, keep the center white portion icon upright, but rotate the green area like a wheel for the duration of the toggle. The big square. First, we need to maximise the clarity of the viewable icon to tell the difference between the various uses of Reserves; and second, it has to be different in shape from a regular click icon so we know it draws from the resource pool. The star shape with the smaller center. Since any one power is a smaller part of the overall macro, the center icon in the white is less important than the concept that it is a macro. Furthermore, the star shape can rotate for the duration that the macro is in effect like I recommended above for a toggle power. Finally the star shape is better illustrative of the concept of a 'wrapper' around an icon. Since we list augments and refinements separately from click, toggle, macro and meta, shall I assume that they are not clickable. I am of the impression that they will also not be placed in the power tray. Accordingly the shape is immaterial. I like the triangle idea put forward in the previous developer post on the issue, so I'll stick with that, but a circle, square, triangle and star could all be used for augments and refinements to further illustrate their nature without fear of getting them confused with the other, clickable, icons. If this shows up in the power tray, I would use the triangle for this too, since it is substantially different from a click power or macro. In this case, I would have the triangle change orientation when activated to reflect the nature of the meta effect. It is a binary. Once you click, the animation is triggered. By being binary, it gave the flexibility for customization. That means, no double click, no long click, you just get "click" and off goes the animation engine. What you *can* do however is have a second icon tied to the same power with an additional mode. So click on one icon, greys out both. That was the origin of the Meta icon idea in the first place. So, you have a "base" power that you click and it animates a relatively quick, low damage attack with knockDOWN. But, also on your tray, you could have another associated icon that, when you click, greys out both itself AND the "base" power, resets the timer on the "base" power, AND initiates a longer animation with higher damage and knockBACK. That the idea? If so, that is genius and totally CoH 2.0. I could see this being great, for example, for using the longer animation with knockback while solo as soft control to help survive, but the shorter knockdown option repeatedly while teaming for more group-friendly soft control. That's the idea which is on the table, yes. Of course playtesting might prove it unworkable, but it looks promising. By doing this, the only thing the animation engine cares about is that initial click, meaning that any animation speed adjustments, customizations, etc, are all self-contained to the animation engine itself, simplifying the entire design. Imagine trying to communicate between the combat engine and animation engine otherwise. "Ok, we have a Heal NO WAIT, it's a Super Heal NO WAIT, it's a....." Also, by doing this we can add unlocks based on situation. Imagine if instead of a snipe being interrupted by movement, it was greyed out unless you were still? Or if your mastery turned some attacks from single-target to AoE if your momentum was above 80%? Understood. And this is all just damned exciting, I have to say. Oh God I hope not! How many buttons are we going to need? Could they all be morphs of the same ability? Yes. But once morphed it becomes that one morph and can not be the others. So, if you have a knock back ability, you could augment it to change it to a knock up or a knock down, but it can only be one. So if you want to be able to knock up, knock back and knock down, you will need to augment three different abilities. Or you can change augments to change the effect, in the middle of an instance perhaps. And the augment could change the animation. For instance. 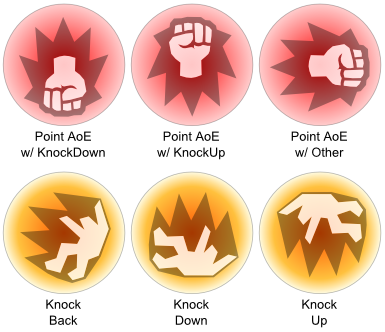 if your normal knockback is a melee attack and you have that aesthecitally coupled to a front-kick animation, your animation would change to a leg sweep if you augment it to a knock-down, or to a high side-kick animation for a knock up effect. But in all of this we have been assuming a binary state. MWM has told us that state effects will be non-binary. So a knock back attack could span the entire range from interrupt => stagger => knock back =>knock back and down =>knock up, back, and down... depending on the power of the attack and resistances of the target. Not intending to put words in your mouth or to create a Straw Man argument, just making a comment related to this statement. I personally really miss the array of power trays in CoH where you selected the correct powers in the correct sequence and pattern to suit the specific and situation, as opposed to the single-tray 123312133121412133141213314151321331 linear mashing that I've seen in the other games I've played. Gimme lots of powers to organize and lots of trays to organize them in and to use to select the correct patterns and sequences based on the specific situation at hand rather than the slightly varied linear sequences that I've seen in, say, Champions, DCUO, and TSW, please! In my opinion the large array of varied and actually necessary and useful powers was one of the strengths, not a weakness, of CoH, and I personally think something as varied and variable would be perfectly appropriate, if not required, for a spiritual successor. What about power names, as we have different animation sets will we be able to "name" the abilities our selves for each of our characters, In addition could we set something like a macro that there is a % chance that our character says something when they perform an ability ? I personally really miss the array of power trays in CoH where you selected the correct powers in the correct sequence and pattern to suit the specific and situation, as opposed to the single-tray 123312133121412133141213314151321331 linear mashing that I've seen in the other games I've played. I agree that limiting our powers to just a selection of five is too limiting. The games that do that are typically geared towards console compatibility. For those of us who prefer to press the hot key for powers rather than clicking them on the screen with a mouse, more than about 12 powers to choose from is too many. 0 through 9 and F1 through F4 is about the most hot-keys people can adequately handle and thats 14 keys. Typically F1 through F4 are used to target allies or handle pets, however, so that brings us back to about 10 abilities before we have to be profession pianists to hit the correct keys while playing. So if you give us 8 to 10 keys across any single power tray, and let us swap power trays with keybinds, then we can start to multiply the number of powers we can use with hot keys. Typically power tray swapping has a limit of three trays before it gets too unweildy. This is because we usually either have a dedicated 'swap to tray #' keybound, or we do what I do, and that is keybind to rotate up and down the power trays. In my case I default on power tray #2 with a rotate down to power tray #3, or up to power tray #1. That way even if you accidentally rotate down when you meant to rotate up, you are still only one tray away and you just rotate one more click to get the tray you want. So pushing the bounds of feasibility gives us 24 to 30 maximum hot keys to play with. That includes not just powerset abilities but every convenience keybind, like travel powers and potions, etc. Finally, not everyone is as capable of swapping between all the power trays as I am, due to age, vision, or any number of other physical limitations, so if we reduce that by 1/3 to about 20 maximum hot keys. Now we have a goal to use to determine if we have too many keys to press or not, rather than talking past each others' assumptions. How about "pick your hotkeys"
How about "pick your hotkeys" ? Other than a possible client-side mod, powers will not be renamed by the player. Macros to activate a text line and an ability yes, by chance no. I'll make a caveat that I'll put it on my list of qol requests to see if we can do something like this at some point. Hmm, don't see any technical limitation on my end. Novel idea. ...about 20 maximum hot keys. Now we have a goal to use to determine if we have too many keys to press or not, rather than talking past each others' assumptions. In CoH, I always had at least four trays of--if I remember correctly--generally 9 powers each on deck, but one of those trays was usually dedicated to toggles + my green-circle auto-click power just to make sure they were up and running. So, 20 could work, but that'd be on the low side for me. I personally wouldn't want any less than that. Thank you for the heads up chaps. In addition could we set something like a macro that there is a % chance that our character says something when they perform an ability? You mean a Chat / Bubble with a battle cry? every 10th time you attack a foe with a certain power? For example you could set a 5% chance or something that, my character being a soldier calls out something like Target on my mark etc. Or maybe for normal shooting have a number of different phrases, like Ammunition Good, Running Low, Need to Change. Yeah it might be useful if we could have some kind of "randomizer" command in the keybinding language so that we could set up macros that would only "randomly" activate. I remember experimenting with "self-redefining" keybinds in CoH that could change the definition a keybind upon each press of the key but even that had to follow a predefined sequence and wasn't strictly random because of that. Making it so that your character screams out a battle cry randomly instead of every time you activate a power would add a bit of "realism" to the whole battlecry concept. I'm still left wondering why you can't "chain" two animations together, such that you have a two stage activation. The "click and hold" activates a "charge up" animation ... just like a Click ... but then the timing of the release then determines which follow on Power activates, with the longer the "charge up" is held changes the variant of the Power that actually DOES result from the "charge up" action. This would then require simply being able to ABORT from the "charge up" animation feeding into the different variations of the Power activated determined by how long the "charge up" was maintained. Simplest example I can think of is a 1 second "charge up" time for determining Knock Back vs Knock Down. If the "charge up" is maintained for less than 1 second, you get a Knock Down variant of the Power ... and if the "charge up" is maintained for 1 second, it will automatically rollover/abort into the Knock Back variant of the Power. The whole thing, as a package, is really 3 Powers ... "charge up" Power, Knock Down Power and Knock Back Power. You just have to setup the "charge up" to feed into the available variants in a functionally seamless way. I think the problem there is probably that it would create a necessary lag between us activating powers and those powers then animating on screen such that the value added goes negative a lot of the time. Here's an idea: since renaming the powers is out, and Macros are totally going to be a thing, it logically follows that people might want to just make a macro for like EVERY power and give them names and use the macros instead of the regular power buttons more often than not. Could we do this, or have the option, at time of power selection? Like you'd pick your power when you hit a level up, then you'd choose colors and animations for it, then as part of that process, it could ask you, maybe at the end, if you want to make a custom Macro for it too and give that a name. For this reason, I think the Macro should always by default be given the same iconography as the original power, including the border shape, but that's just me. On the topic of a power that can change from KB > KD > KU and having 1 icon per I could see this working if said power would bring up a sub-list of the desired effects on the 1st activation and then the 2nd activation to determine which option. PowerTray Slot 5 has the KnockX power. You press '5' or click the icon and a pop-up window appears over the icon with KB, KU, KD options. You then press '1', '2' or '3' or click the appropriate icon to activate that power with the desired effect. Obviously this is a bit slower than a single activation power but its nto THAT much slower. While the possibility of using a different button shape for each of the categories given might seem appealing at first, I feel that if there are too many of them, the result may be a kind of visual information overload where players may simply ignore the shapes entirely, and we end up worse off than if we'd just used a few shapes that are easy to tell apart from each other. As such, my suggestion is that we have shapes inform the player of how long a click's power will last, as opposed to what the click's effects are, since we already have the power icons themselves to remind us of those. One (the default tray) for common use powers and combat related macros (Main attacks/controls/heals), one for long cooldown powers (Hasten, Chronoshift, tier9 armors/nukes, incarnate powers, AoE holds etc), one for toggles, one for accolades, one for temp powers and one for non-combat related macros. I've got to agree with Derangement. (As noted in my initial post) I feel like there's just too many shapes, and that having so many shapes honestly just serves to muddle and counteract any sense of clarity you mean to impart by having so many. Skyforge (for example) has numerous icon shapes that go on your powertray and it just leaves me feeling scatterbrained a lot of the time. Click: You click the icon and something happens. Toggle: You click the icon, and something happens and it stays happening until you click it again. Reserve: You click on this icon to activate your reserves. Macro: You click on this icon, and it does one or more tasks which you assign to it. Meta: You click on this icon and it adjusts other powers, such as buffing them for a short period or triggering a time limited period where your powers change. A few notes on the design elements. You might notice around the icons rim a series of symbols. These are called the Nimbus, and are used to indicate certain features of the power within (to be explained in further detail in an upcoming update). They are only used for powers, however, so for Reserves, Macros, Augments and Refinements, they will not be there. This may not be critical to your question, but in the image each socket has prongs to 'hold' the item in place. If it was solely a question about the shape of the widgets, the socket wouldn't be in consideration. The prongs are a bad idea. they obscure the item in question, especially if there is a 3D click state or a swirly around the edges to denote a toggle state. The sockets in Line 3 for the starburst do not match the shape of the widget and will cause confusion when slotting. When you talk about "around the icons rim a series of symbols. These are called the Nimbus, and are used to indicate certain features of the power within", are you talking about the teeny tiny green & red dots? If so that is a horrible visual identifier. The markings are way too small and the differentiator between the two are the colors used. I would suggest a larger marking that is both shape & color unique, OR apply a pattern to the green border of the widget. Question for you on the "click" icons: Are you constraining the hit box to the actual shape of the icons? If so, the only reasonable shapes are Square/Circle/Octagon. I would suggest making all of the clickable icons square shaped then make the inner graphic (the gray area) uniquely shaped to identify the intended effect. A.) The inner graphic for a Toggle could be circle shaped and could have a race track animation around that shape's border to signify when it is active (along with whatever 3D "pushed" effect there is on the entire button). C.) The inner graphic for a Macro could be a hexagon. It is visually different enough and there is enough room in the center for a customizable icon/graphic/character to make it meaningful to the user. The "prongs" you mentioned are the Nimbus. Are the Reserves more like Inspirations or Defensive Toggles from CoX? Here's my input on the subject. Serve us as many member berries as we can eat! Game is in remembrance of CoX after all. Click: #6 Because member! Also, circle's are just the most clean to look at. And we're gonna be looking at them a lot. Toggle: #6 Because member! Should look nice by simply using the same icon but spin the outer circle while active and maybe add a glows to the dots and health symbols to show it's on. Reserve: Depends... #6 if Reserves are like Defensive Toggles from CoX. If they're in the same tray as the above powers than stick with circles but use a different color. Red Attack/Blue Defense/Green heal etc. #5 if Reserves are like Inspirations from CoX. If they're in a seperate tray. Because member! Just clean up that square icon to look as nice as the others please. Macro: #4 I like the Hexagon for this. Separates and distinguishes itself enough. Augment: #1 I like the Triangles for this. I'm hoping you will only see these in a separate menu screen away from combat. Refinement: #1 Still liking the Triangles here. I like what others have said about flipping it upside down and attaching it to the Augment. Meta: #2 I like the Octagon here as it distinguishes itself as a different kind of power but keeps a circular shape overall. Reserves will be put in place largely to do what Inspirations had done in CoX, but they won't work like Insps did mechanically. In CoT, the idea is that when fighting, we will have Health, Endo, and a "Momentum" bar. You will gain Momentum during fights as you attack and are attacked and you might have powers that gain some benefit from having a high Momentum. Momentum will bleed off over time, and when it does, it will drain into the Reserves bar. So as you fight, you gain Momentum, which is a temporary state of heightened ability and so forth that might buff you or modify your powers in various ways, then as that naturally dies out over time, the Momentum you lose will be drained into filling up the Reserves bar. I believe this will be a separate bar that tracks how much "Reserves" you have, "Reserves" being a fluid quantity like Health or Endo, but the Reserves don't refill over long periods of time naturally, they are only filled by Momentum bleeding off. So as you fight, you gain Momentum, then that Momentum bleeds away and fills your Reserves. Then, you will have various ways to spend accumulated Reserves to do some of the same stuff Inspirations did in CoX, like regain HP, Endo, temporarily buff you, Wakie type effects, etc. That's how I understand it. The buttons that you'd click on to use Reserves are what I assume the OP meant to choose a shape for. So you are saying the gray triangles on the edges of the sockets (even the empty ones) are the Nimbus? More akin to Inspirations, but more flexible. Correct. They change to bright or dark depending on the parameters. I feel the layout of these Nimbus prongs on the edges of the socket make the area look exceedingly busy (especially for empty sockets, see line 3 & 6). I am curious to find out why you have Nimbus prongs on empty sockets. Is it a state change for the character or a state change for the individual power (i.e. does it have to be on the button itself)? Are the Nimbus prongs part of the button hit box? They hang out into the dead space between buttons and will potentially force a larger layout (maybe limiting options). If I wasn't given any additional information about these prongs I would have completely dismissed them as window dressing (annoying). How would this impact user customized UI solutions (either via whatever in game option that is available or 3rd party if that is allowed)? How big or small do you need these Nimbus prongs to be to have a significant impact so the user recognizes that a state change has happened? I will double down on my assertion that all clickable buttons must be squares. All buttons that can have a state change like these Nimbus prongs must be squares. You are trying to impart multiple possible state changes to a single button, therefore the real estate must be large enough to accommodate iconography and/or animation so each button doesn't look like some jumbled mess whenever you click on them. You potentially have to deal with: The power icon (gray area), those little green/red dots, a string (in the case of macros), a string for a keyboard shortcut somewhere on or below the button, a 3D rendering of a clicked state when the power is recharging, an exclusion state when you are mez'd/cc'd, an animation for toggles in a toggled state. I would suggest using the square shape with the prongs in the corners, but invert them so they align with the shape and look like a part of the button instead of some overlay that is separate (window dressing). My nostalgic brain wants all of the clickable buttons to be circle shaped, but I have not heard a convincing argument as to why. That is why I am sticking to squares. I would like to know the significance of the little red or green dots (in the green field on the outer edges of the shape) on the buttons signify. To be explained in a future update. I'll be interested to hear that explanation. Until then, my stance on them remains the same. the teeny tiny green & red dots? If so that is a horrible visual identifier. The markings are way too small and the differentiator between the two are the colors used. I would suggest a larger marking that is both shape & color unique, OR apply a pattern to the green border of the widget. And that's fully understandable. I'm just letting you know that answer will be forthcoming. For like the one billionth time since August when I got suckered into playing GW2 by a friend, I'm going to start a post with the words "In GW2..."
In GW2 all the powers use square icons, you can't have more than 10 of them, and there are no Nimbi or anything else to let you know what kind of power each is. It doesn't matter. People still use their attacks and AoEs and pet summons etc like champs anyway. I don't actually think the Nimbus or the different shapes are really necessary. Nice, but not mission critical. I have to agree, really. Let the buttons be round or square, whatever looks nice in the UI, icons and effects can tell us a little about the powers, but be sure to have roll-over pop-ups that give more details. When I'm Playing, I never look at the power icons anyway, 1 is the auto-attack, 2 is the basic attack, 3 and 4 are extra attacks with special effects, 5 is AoE and 6 is 'heal', the rest are toggles and 'situational' powers that only get used... when the situation warrants it. Alt- or Shift- 1, 2, 3, 4 are those 'meta' powers. There is really no need to get 'fancy' with the buttons, since I'm never going to look at them in the heat of battle. It will be a rare thing, if I select a power with my mouse-pointer, I only use the mouse to control the camera and sometimes to move, when fluidity matters. When precision and control matter, like in combat, or jumping-puzzles, I switch to the number-pad for movement and targeting. That let's me strafe and back and chord turns, which the mouse cannot do. I was seeking advice on straightening things out, when I took this screenshot. My point is, having lots of differently-shaped buttons is not going to add more clarity. Keep it Simple! this is what worked for me. not mine, googled it. row 1 starts with light to heavy or longest recharging being near the end. row 2 starts with taunt, build up / aim / rage / etc..., self heal, MoG or other, followed by defense toggles near the end. row 3 ... sometimes i didn't even need it, travel power and the like would be there, which i might keybind. do you think players would like more richer icons, or more flat silhouette ones, with subtle shades perhaps? I would say that if there's going to be little widgets and bits n bobs superimposed on the icons that relay information about the power (type, range/radius/shape of effect, targets, etc) then I'd like the icons themselves to be simple, so that the vital information doesn't just get lost in the noise. The screenshots from Fireheart and Izzy are a perfect illustration of the point I made on another thread supporting a game-wide icon scheme similar to that of our old game and avoiding square 'painting' icons. While some players won't look at the icons, some (like me) will do so frequently. I don't know what power sets were in Fireheart's build, but just by looking at the icons I can tell what about 2/3 of them would do. In contrast, I can't even tell what some of the pictures are meant to be in Izzy's square icon example, much less what those buttons might do. I agree with trying to keep the buttons as simple as possible. I think part of the reason why it was easy to not get too lost when swapping between multiple characters was the shared iconography between powersets. You generally knew what powers were cones, fast low damage, slow high damage, etc. We know Dev wants at least two different states (beyond just standard usage states like exclusions or recharge) for presumably all clickable buttons >> Nimbus and the yet to be disclosed "dots"
We know that Nimbus impacts powers on a power by power basis (or by set), otherwise there is no reason to want to display it on the button itself. Why not just make all clickable buttons circle shaped and have displays for these state changes in the real estate around the button? With the circle shape you will have four rough triangle regions around the button to display those state changes. All of it will fit into a square layout. You can still render the standard usage state changes on the button itself (exclusion, recharge, toggle, etc) without obscuring the button. If you want shared shape iconography, they can use the gray area in the center (either the actual shape or the icon in the center), essentially duplicating approach used in City of Heroes.